Welcome to the official discussion thread for Professor Layton vs. Ace Attorney on the 3DS! To start, please add this game to your log, add it to your collection (if applicable), and (when you are ready) rate it using the link above! I literally deleted and recreated this thread just to get this image, you people better be happy. I have never played any Ace Attorney or Professor Layton games although I've heard plenty about them from RFN's infamous James Jones. So far, very first impression: Capcom's Ace Attorney PUNishment crew that James has made several references to is in full force and I had to use a hint coin on the first puzzle. I'm looking forward to picking this game up down the line. I enjoy the Layton series and have curiosities about the Ace Attorney series. I figure this might be a nice way to tackle both. There wasn't an official thread, but Shadowlink's review thread at the top of the second page has some discussion within. There's nothing wrong with an official thread though. It's too bad you haven't played the original games first, since that particular "OMG THEY JUST MET!" enjoyment won't be there. BUT, I think it works well on its own since it doesn't really rely on each particular series' stories or recurring characters.... Just the protagonists. I should get back to this! Also my 'Eep it's here!' thread. In hindisght I should have just bstarted an official thread back then, but eh. It's Zero's fault. Somehow. I probably wouldn't mention anything if it weren't for the game being out in Europe for the past 7 months I believe. Well my original thread was because of the PAL release . ...Although I didn't actually get around to playing the game for a few months. I only just put up the review now because it was finally relevant. I think I was the only one here with the game for ages. Emeer for Smash. Emeer for smash. @DrFinkelsteinAre you on an iphone or Android? I think on both, the Ace attorney Trilogy is on there. The first case I think is free. Android. Really now? I feel like someone told me that before but I must have forgotten. Was it you? I can't find it in the Play Store though. Hmm I think the Android version looks like it was planned but I think it was cancelled. Sorry! If you have an iphone or iPod touch around you could use that. This is on my "to play next" list. Gotta finish up Dual Destinies first though! I finally finished this game tonight. It was pretty good overall, but I feel like the way in which all of the narratives mysteries were solved could have been more dynamic. The game keeps adding mysteries up until the final court case, which consists of a full-legnth court case followed by almost 2 and a half hours of straight exposition. Don't get me wrong, once I adjusted my level of suspension of disbelief to appropriate levels I enjoyed the story's twists. It's just, following up a fully fledged trial with enough information that it takes the length of a film to explain things can leave the viewers feeling a bit fatigued. Like I said, it's good, engaging stuff. It just happens to back-loaded into the final hours of the game. @Hero_Of_Hyrule the entire ending is just the Professor sitting in the corner going "I know who it is" like a little kid taunting you on the playground. Who else but the professor could have predicted such a typical Prof Layton-style left field ending like that though? IMO, the story twists/endings in the Ace Attorney series are a bit more grounded and satisfying. Layton endings kind of remind me of a substitute teacher we used to have back in high school. He'd spend the lesson peppering us with 'brainteasers' that no amount of logic could actually solve. Like there'd be a 10 minute rambling story about a plane flight, and at the end we'd have to figure out the name of the airline. The answer was always something completely ridiculous that had nothing to do with the story and would invariably come with another 10 minutes of ridiculous backstory to explain. On the plus side, we didn't do any actual work during those periods, so that was nice. I finally beat the game and unlocked the Bonus Episodes. Has anyone else played these episodes? They are very self-aware and often hilarious. I particularly like the discussion when some of the characters complain about the silly names the developers gave them. Each has one bonus puzzle as well! So, I'm not really digging this game. 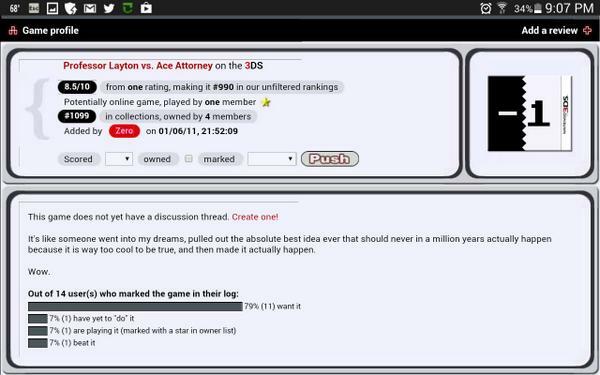 A bit of quick backstory: I love the Ace Attorney series, and in 2007, I joined a message board that wanted to make an Ace Attorney musical. I wrote about 10 original songs for it throughout the course of a couple years, made lots of new online friends (several of whom I keep in touch with today), went to multiple conventions with these people...and, oh yeah, I met my wife through it. She played the part of Mia. I'd only played a little of Layton prior to this game, maybe 3 hours of the first game. I liked the puzzles more than the story. So as part of my wife's birthday present, I got her this game (since we'd both played through and loved all prior Ace Attorney titles). But I'm about 10 hours in and I've got quite a few issues with this game. For starters, Luke and Layton are honestly pretty dull characters. Layton is this perfect gentleman that always has the answers, and Luke is like the slightly more naive version of Layton. They never disagree, they never have any conflict between them. And there's so much repetitive dialogue! "Luke, it would seem that this town is most peculiar." "That's right, Professor! Most peculiar indeed!" "It reminds me of a puzzle..." Exploring with these guys is like having two butlers narrate everything. Phoenix and Maya make a far more dynamic and entertaining duo. Even when the AA games were at their dullest in the investigation sections, you could always rely on Maya's crazy non-sequiturs and Phoenix's snarky inner monologue to deliver the laughs. Thankfully, they've at least kept that element of their personalities intact, but it makes the Layton/Luke bits seem all the dryer in comparison. Secondly, the puzzles are pretty underwhelming so far, for the most part. I loved the riddle-style stuff in the first game, thought it was really clever. Most of PLAA's puzzles boil down to these visual maze-type things that mostly require a lot of trial-and-error manipulation. I liked the clever "think outside the box" word problems of the first game a lot more. Third, I'm not digging the setting. Having the game take place in a universe separate from both Layton and Wright isn't a bad idea, but it kinda makes all the logic stuff pretty moot when you have magic involved, and any mysterious thing can literally be attributed to "a wizard did it." For instance, there's a mystery somewhat early on where a big giant tower appears in a pillar of flame. In a normal Ace Attorney game, this would be a moment where the player would think, "Whoa, that was crazy! I wonder how they managed to make that happen!" In this game, though, it's obviously just from some friggin' spell we've never seen yet. It removes a huge amount of the mystery and intrigue when any illogical thing can simply be attributed to magic. Fourrrrrth, what is with Layton barging in on Phoenix's court case and having all the answers? This annoyed me. I like the idea of these two guys working together, but I don't like how Phoenix seems dumber than before compared to Layton. Layton's a smart guy, but he shouldn't be automatically able to bust into the courtroom and do Phoenix's job for him. It seems detrimental to Nick's character. Finally, man, that ending to the second court case was super dark. *SPOILERS* Typically it feels fun or satisfying to catch the killer, even the sympathetic ones. But in this game, the guilty party is pleading for her life and is burned alive in front of everyone!! Whaaaaaat?? This world feels very primal and brutal to me, arguing with a bunch of regressive people with old-school witch trial mindsets, and it's both frustrating and super-dark. I thought that was a poor tonal decision for a game like this. Anyway, the music's good and some of the court stuff is fun, but thus far, I'm not crazy about it. Even the NPC characters seem flat and uninteresting, a big change from the usual AA fare. You might want to keep playing. The broader flaws you mentioned don't necessarily improve, but some of the more specific things you mention are expanded upon. And the endgame twists may turn things around for you. But I mostly agree with everything you've said. I've played all but the first Layton game and had no experience with AA going in. I thought the game wasn't anything spectacular, while at the same time not extremely flawed. I would put it above 1 or 2 of the 5 other Layton games I've played, but it doesn't come close to taking the top spot. Actually, my favorite part of the game was the trials, which were brand new to me. Their exciting moments juxtaposed with the rest of the game's slower and more methodical gameplay very sharply. The Layton series has become tired. Its puzzles have shifted towards manipulating objects, rather than focusing on a problem and the formula of "arrive at a new place, see the inciting incident, walk around and make dull observations for most of the game, discover something important at the end, climax" has gotten old. It's tiresome and boring to meander around a big, rustic town, talking to boring people. I understand that this is most likely done to deliver the puzzles within the context of the plot, but it's frustrating to have to wade through this stuff when you want to advance the plot or do something that feels more meaningful in the game. The dull writings contributes heavily to this problem. A lot of the time it feels like busywork between important plot points. This isn't as bad in VS, but it's still somewhat present. After playing this, I finally picked up the first AA game, and its exploration segments are handled way better. From what I've played, there's nothing that really wastes your time. Everyone you meet plays an important role in the case or the overarching plot and the characters are all distinct and memorable thanks to their exaggerated traits and flavorful writing. I honestly can't think of 1 minor character from the last Layton game I played, but I can remember plenty from what I've played of AA. Its dull points aren't as dull and its high points are more exciting. That's not to say that I dislike Layton. I loved the series when I first played it. But after 7 (or in my case, 6) games, the series has become dull and tired. It's kind of sad to see Layton's story end and I will miss it, but the series had been growing old and I think it's time to give it a rest. Yeah, I don't plan on quitting the adventure. There's still stuff I like, but I'm used to the AA games being extremely compelling. I am glad to hear that you picked up the first AA since playing this and really like it. I'd recommend the original trilogy, in fact--they're all excellent stories (minus a dull case here or there), particularly the third game, which ends brilliantly. How far are you into the original AA game? The Second Witch Trial is quite literally the point where the the game really reaches it's... Shall I say, Golden Stride. They never disagree, they never have any conflict between them. Fourrrrrth, what is with Layton barging in on Phoenix's court case and having all the answers? Good to know things pick up a bit--like I said, I'm not quitting or anything, but it's pretty different from past AA games.